An energy-boosting, vegetable-packed smoothie bowl that will keep you satisfied until lunch time. 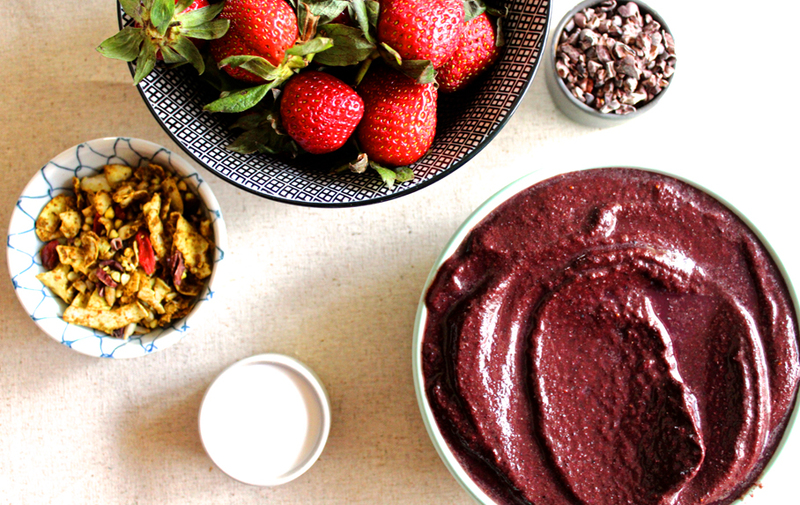 If you’ve ever had an Acai bowl, you’ll likely be familiar with their sweet, creamy and refreshing qualites. For many, it’s the perfect Spring and Summer breakfast and all-time favourite cafe breakfast treat. Acai bowls, especially those that you find out at cafes and smoothie bars, often contain far more sugar than you would expect. Acai, the vibrant purple berry native to South America, has been touted a superfood due to its high antioxidant potential, which is true and worth jumping on the bandwagon for. Antioxidant refers to the potential and ability a plant food has to counteract oxidation, which is known to cause ill-health and disease. Acai itself is low in sugar, however commercially made Acai bowls most often use sugar-sweetened frozen Acai packets and often blend other fruits like bananas, mango, watermelon and berries into the mix. Some of these beautiful creations clock-up 50 grams of sugar per bowl, which is double the recommended sugar intake the World Health Organisation suggests we consume each day! This Acai bowl recipe contains only 1/2 a cup of blueberries (which contain approximately 7g sugar) per serve and is instead loaded with vegetables which pack a nutritional punch and will see you consuming 3 out of the recommended 5 serves of veggies before lunch time. Before you scrunch your nose up at my suggestion to blend cauliflower and zucchini into your breakfast, you need to trust me and try it. Hand over heart, you honestly cannot taste these vegetables, which makes this recipe great for kids too. Written by nutritionist Kate Levins for Nuvia. 1. Place the frozen Acai packet under running water for about 30 seconds to loosen the Acai pulp from within the packet. Break it into two pieces while it is still inside the plastic, then cut the packet open and add the contents to a high speed blender. 2. Add all other smoothie bowl ingredients to the blender and blend on the lowest setting for about 15 seconds, scrape down the sides, mix everything together and repeat to break down the ingredients completely. 3. Increase blender speed to high for 30-60 seconds, until all ingredients are well combined. The mix will resemble ice cream consistency. 4. Pour mixture into a bowl and top with our suggestions or your favourite toppings. 5. Photograph, upload to Instagram, devour and enjoy! 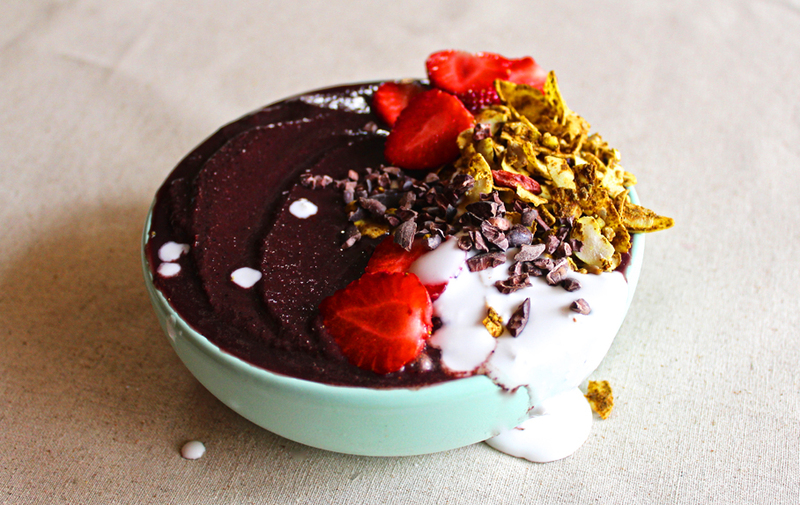 Freeze this smoothie bowl without toppings in an airtight container for up to one month. Defrost over night in the refrigerator and decorate with toppings once defrosted.If you are not planning to freeze this Acai bowl for a later date, it is best consumed immediately after making. If desired, your favourite protein powder will blend into this recipe really nicely. If you would prefer to use Acai powder, simply reduce the amount of liquid you’re using to blend the recipe from 3/4 cup, to 1/2 cup. 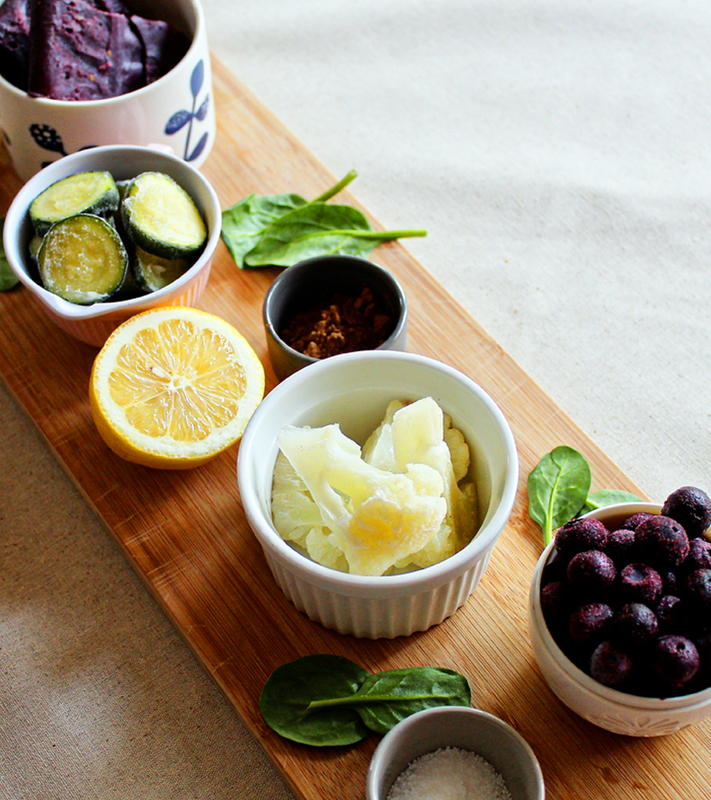 Top your Acai bowl with anything you like. How about… coconut flakes, chopped nuts and seeds, any fresh fruit, cacao nibs, nut and seed butters, dairy or coconut yoghurt, granola or muesli? Go wild!